Blues is My Middle Name: Can Anyone Help? Like millions of other people, I'm currently absorbed in my family research. Having now got a tree full of branches and leaves, I'm back to filling in a lot more of the details. One such detail is my grand fathers first world war record. To be able to access those records, I think I really need to have an idea what regiment he may have served in. And this is where I need your help. 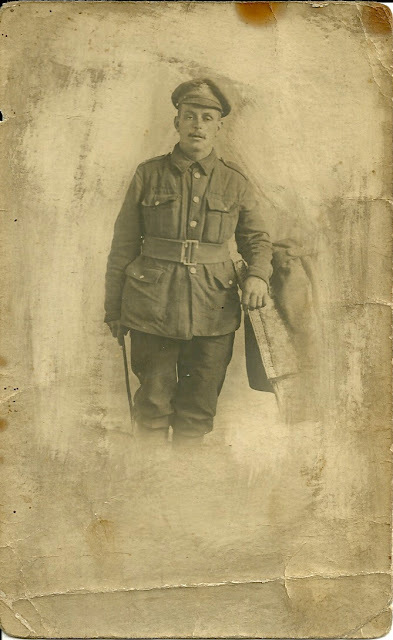 This is a post card picture of my grand father either during or after the war. I have the original. Can anyone hazard a guess as to the Regiment from the picture? Or does anyone know how you go about trying to identify military uniforms? His name was William Gronnow, and he was born in Farndon, Cheshire in 1887, and died in September 1952. He married Miriam Gronnow (nee Valentine) in December 1920. As he was brought up on the English/Welsh border, he could well have joined a Cheshire or Welsh Regiment. If any one has any advice or help to offer, I'd be very grateful. My email address is in the 'about me' section.